The Board of Inquiry into the misappropriations of Sri Lankan Airlines findings highlights a massive figure of US $ 865,398 that was written off by Sri Lankan Airlines due to a retrospective amended change made to the original contract signed between the national carrier and Phoenix Duty Free Services. However Colombo Telegraph reliably learns that this particular finding led the airline to lose a further monumental amount of US $ 2,596,198 over the subsequent next two years of 2013/2014 & 2014/2015. The Board of Inquiries’ findings revealed that the former CEO Kapila Chandrasena, the former Chief Marketing Officer G.T. 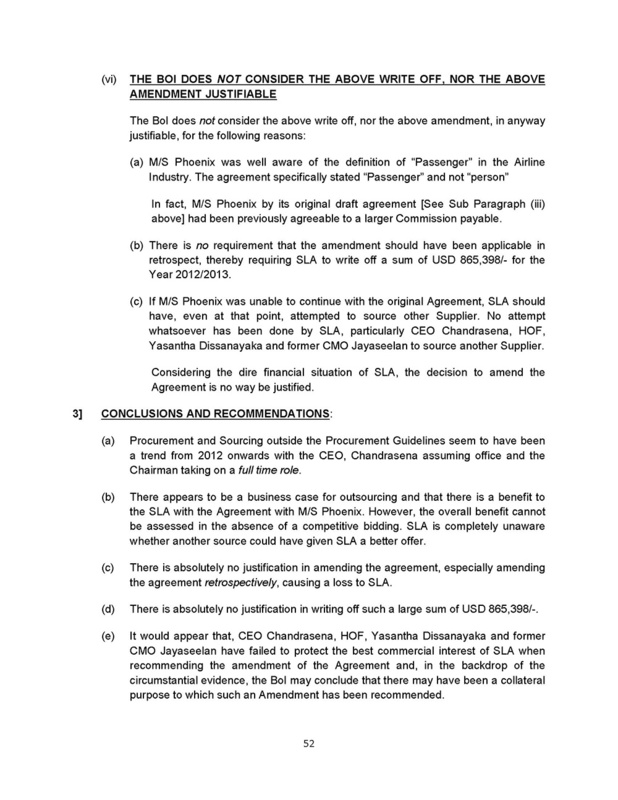 Jayaseeelan and Head of Finance Yasantha Dissanyake had submitted a board paper on the 26th September 2013 seeking the airline’s Board of Directors to retrospectively amend the agreement seeking approval to write off a figure of US $ 865,398. This amendment which was approved and changed by the former Board of Directors for the financial year 2012/2013 has now proved be a suicidal decision the former Board of Directors of the airline made as it affected the bottom line of the airline for the next two completed financial years of 2013/2014 & 2014/2015. The report’s highlighted loss of US $ 865,398 per annum was only for the initial contractual year ending 2012/2013. This meant that with the guaranteed payment terms been defined on an ascending ‘year on year’ that amendment realistically affected the struggling airline a minimum of US $ 2,595,198, which is three times the said written off figure which should include the now completed financial years of 2013/2014 and 2014/2015 as well. With the now commenced 4th operational year of this contract in effect as of 01/04/2015, the airline is set to lose out at least another US $ 2 million in the next two years when the contract eventually expires. “Should not this contract be immediately terminated as it is now proved to be the case where innocent tax payers monies are being robbed of in the broadest of day light?” asked a rather disgruntled employee of the national carrier. 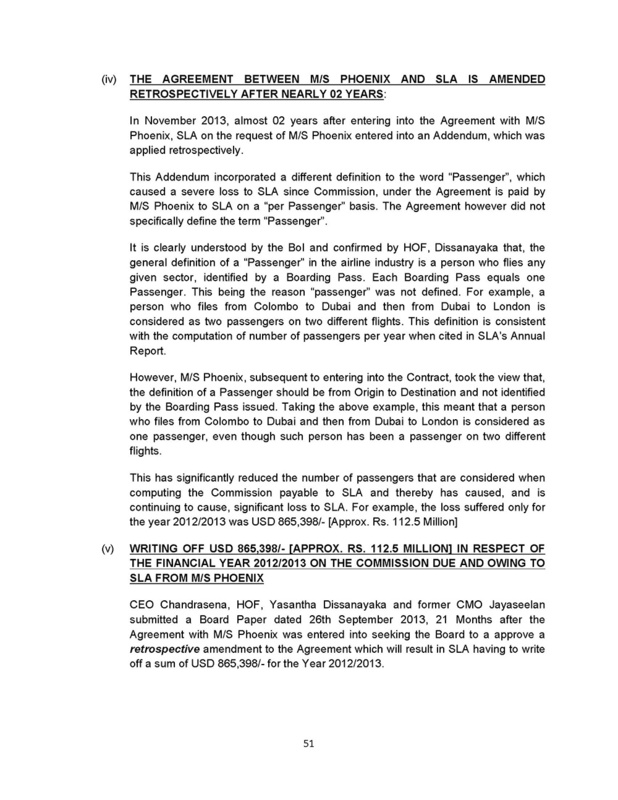 The reason for the execution of what now seems to be a fraudulent ‘business deal’ from the beginning of this contract itself is that Phoenix Duty Free Services had agreed originally to pay a guaranteed fee to the airline per ‘passenger’ traveled as opposed to the sale of duty free carried out on board. It is reported that Phoenix Duty Free Services on signing the contract and after a year questioned the airline about the definition of a ‘passenger’ travelling on multiple sectors on a single journey. For example a single passenger travelling the journey from London to Mumbai would have to travel on two flights such as London/Colombo and then onwards from Colombo/Mumbai. The confusion lay in if this said passenger is counted as ‘one’ or ‘two’ for the ‘Origin London’ to ‘Destination Mumbai’. During the month of September 2012 a meeting was held at the Board Room of the Sri Lanka Airlines office at the World Trade Center where the then Chief Marketing Officer (CMO) G.T. Jayaseelan openly informed officials of both the national carrier and Phoenix Duty Free Services that a colossal count of an average of 37% of passengers who travelled on the entire Sri Lankan Airline network were classified as ‘Origin to Destination’ travellers and the passenger count was duplicated in their books. This open revelation by the CMO Jayaseelan led to the writing off of 37 % of the guaranteed payment that Phoenix Duty Free Services had to pay the airline. What has had many questioning the former Chairman Nishantha Wickramasinghe and CEO Kapila Chandrasena, the Board of Directors and the Phoenix Duty Free Services officials is if this was all part of greater well-orchestrated, strategically planned and execution of the perfect robbery of the national airline from day one of this signed deal? It will now be interesting to find out as to ‘who and who’ benefited and continues to still benefit from this ‘ongoing fraud’ as most of the Senior Management Team of the airline and former Directors of the Board all went ‘gaga’ then about this ‘unbelievable’ contract that was offered initially to the airline, said a senior manager who did not wish to be identified. He is barred from officially talking to the media. Airline official also went on to say that due to the poor planning of the airline’s Senior Management Team a shortage of ‘Cabin Crew Supervisors’ took place, where a huge total of 225 flights in August and 189 flights in September of 2013 departed Colombo without the carriage of duty free goods for sale on board. Phoenix Duty Free Services then went on to compile the passenger loads of this total of 414 flight doubling it to include the return sectors and based on the original contract, another colossal amount was written off by the airline for the failure on their part to carry duty free goods for sale on board. Other notable findings by ‘Colombo Telegraph’ is that the supply of the current Business Class toiletry kit branded ‘Bvlgary’ was offered to Raju Chandiram who was instrumental in submitting a sample to the Product Development Department of the airline and securing the deal without a tender been called for the supply of it. Currently that product is delivered to the airline through one of Raju Chandiram’s Chinese contacts. One other openly violated practice of the existing contract is that the items purchased by Phoenix Duty Free Services using the Sri Lankan Airlines ‘bar code’ which in contractual agreed terms does not come directly from the supplier to the bonded warehouse in Katunayake but goes instead to a warehouse in Singapore. ‘Colombo Telegraph’ reliably learns that duty free goods such as alcohol, cigarettes and perfumes are widely known in the duty free circles to be fraudulently sold through what is known as ‘cross border’ sales otherwise known as the sale of ‘black market’ duty free goods to third parties. 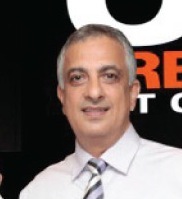 The five year contract with a possible further two year extension was originally signed by the former CEO Kapila Chandrasena and Manager In-Flight Services Rashmore Ferdinands representing Sri Lankan Airlines and CEO Dilan (Rumesh) Wirasinghe and Managing Director Raju Chandiram of Phoenix Duty Free Services. Rashmore Ferdinands one of the signatories of the now controversial duty free contract takes care of things for Phoenix Duty Free Services as an employee of the airline and continues to hold onto a lucrative Grade 10 Managerial position reaping the benefits of all the perks that comes with the post. Formerly the job Ferdinands now holds was entrusted to an employee who held a lesser Grade 9 post within the airline when the entire business of duty free purchase, warehouse and sale was completed by the national carrier. A member of the Flight Attendant Union (FAU) also complained verbally that during the first 18 months of the operation Phoenix Duty Free Services deprived the entire airline’s staff of the contractually signed discount percentage. After a colossal loss and 18 months later it was rectified to what it should have been, where all staff now get a 25 % discount on all products purchased on board. “I hope the Bribery Commission and Inland Revenue teams get on Raju Chandiram’s case and investigate him and also arrest Dilan ‘Rumesh’ Wirasinghe whenever he comes down to Colombo. The new Chairman Ajit Dias and his team should attempt to recover our robbed monies from Phoenix Duty Free Services in the first 18 months. This amount blatantly stolen by depriving the staff of their due discount seems meager and has gone unnoticed due to the severity of the bigger amount of money that has been scientifically siphoned off the airline” complained the FAU Member. An Open Letter To Dr. Indrajith Coomaraswamy, The New Governor Of The Central Bank! SF Case: Registrar To Convey The Decision To The Secretary Of The Ministry Of Justice.